DeWalt Masonry Bit Hammer Drill Bits Set of 7 Rock Carbide DW5207 - NEW! 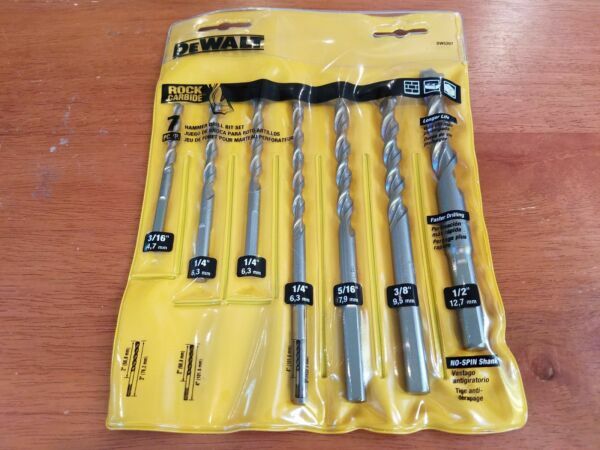 Video Reviews of DeWalt Masonry Bit Hammer Drill Bits Set of 7 Rock Carbide DW5207 - NEW! DeWalt Masonry Bit Hammer Drill Bits Set of 7 Rock Carbide DW5207 - NEW! Set of 7 of variety sizes. See pictures. Box/packaging may have wear and tear along with creases, tears, bends, cracks, and/or dents, and/or price tag sticker residue. Please look at photos. Payment Information: We accept all payments via PayPal only. If payment is not received, we will open an unpaid item case. Shipping Information: Orders are processed and shipped only after payment has cleared and the order is complete with a proper deliverable address. We do not ship to Military addresses. We ship using both FedEx and USPS. Restocking Fee: If the item is returned due to an incorrect address, or the recipient refuses the package, or changes their mind, a 20% restocking fee will be taken out of the refund once the item is returned to us. We strive for 100% satisfaction. If you are unsatisfied, please contact us! Thank you for shopping with us! We encourage you to check out our other items, as we always sell a variety of items.